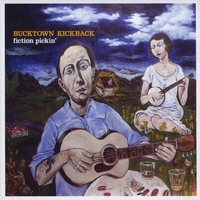 Bucktown Kickback tastefully blends bluegrass, blues, country and rock & roll forms along with provocative stories and images to create foot-stompin, barn-burnin, tear jerkin songs about everyday living. "Ace Americana band...smart, rootsy, acoustic-based music"
...Fans of artists such as The Gourds, Yonder Mountain String Band, the Grateful Dead and Whiskeytown will find plenty to cheer about in the songs and eclectic-but-focused style of Bucktown Kickback...The recipe for Bucktown Kickback sports heavy doses of bluegrass drive and fleet-fingered chops, plenty of tear jerking honky-tonk, a sprinkle of rock swagger and singer-songwriter flair, and Dudding’s love of narrative songwriting and easygoing melodies...Blurring the lines between Americana, jamgrass, honky-tonk and roots rock..."
Released on Tuesday, March 17, 2009 accompanied by a celebratory release concert for fans, friends and family at The Bluebird Café in Nashville, TN. The performance included the same studio lineup as the album; Adam Brooks Dudding (acoustic guitar, vocals), David Blankestyn (drums), James Donovan (bass), Charlie Pate (mandolin) and Mick Chegwidden (dobro, banjo, electric guitar).